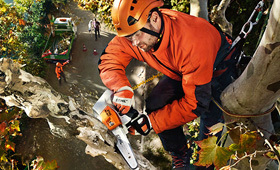 STIHL chain saws are also the first choice for professional arborists. In combination with STIHL cutting attachments, these powerful lightweights with extra high full-throttle rotational speed impress with their exceptional cutting performance and clean cutting surfaces. For tree maintenance that saves your strength.